Humans are supposed to breathe with the nose that has been designed very well to filter the air and turn it warm and humid before it enters the lungs. The air will flow into the throat well without any turbulence if we breathe through the nose, but the air may create strong vibrations while it hits the back of our throat, which will only happen if we breathe with mouth. These vibrations are what cause snoring in many people. The throat acts as a flexible muscular tube that has 2 main duties of breathing and swallowing. There is a series of muscular contractions in peristalsis process that pushes the food we swallow into the oesophagus via our throat. This process is what needs the flexibility. However, you have to know that when we are asleep, our body’s muscles are completely relaxed, and the throats muscles are not the exception. This is why any obstruction will lead to vibration; in other term, snoring. Trying a good mouthpiece could be an answer if you recognize yourself to have the mouth open as to what causes snoring in your sleep. The mouthpiece will protect you from oral breathing during sleeping. Try to have a look at Snore Guard or other similar products for this case. 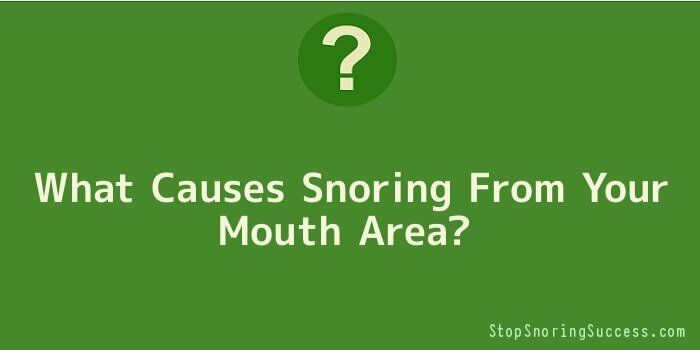 People with improperly formed lower jaw would also experience snoring. The snoring sounds are coming from the tongues base that leaves your throat to be particularly restricted. Retrognathia, or weak chin, is also caused for some people to snore. When people with these weak chins close their mouth, the lower teeth are placed way behind the upper ones, and they are usually have an unusual bite. In this case, it is best to get a device that brings your lower jaw forward. Get a simple test by making a snoring noise with your mouth closed, and after that, do it while biting on your tongue lightly forward from your mouth with your lips sealed. Try using the Tomed SomnoGuard if you can’t snore with your tongue forward. The lower jaw is going to advance for either semi-permanent or even permanent. It will also result in the change of how your teeth meet together that you may have to get a different way in chewing your food. This treatment with mouth guards is considered as a big help in relieving many cases of snoring. However, if you can’t breathe with your nose, you are not going to be able to use the Torned SomnoGuard or Snore Guard. Nasal congestion might be caused by the dust mites in your home making allergic reaction. A simple thing like sucking up the allergen from your old pillow would lead you to snore if you are allergic. For this problem, you may try getting a new synthetically filled pillow, such as ‘Intervent’ pillow case liners. So, how do we know if the treatment route we undertake is hitting the right one? You should recognize it is really what causes snoring if your snoring decreases for some times and then returns for the time being with the related treatment.